Recently I reviewed one of Karma Wilson‘s latest books, Mortimer’s First Garden, and now I have two signed copies of Bear Feels Scared to giveaway. Bear feels Scared touches on many great topics suitable for preschoolers: friendship, feelings, feeling scared, and helping others. Using rhyme, which Karma does so well, and the repeated refrain “And the bear feels scared,” a beautiful story of compassion unfolds. 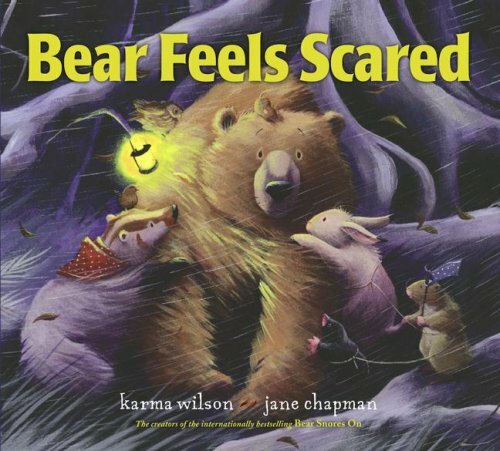 Thanks to Karma Wilson, I have two signed copies of Bear Feels Scared to give away to two individual lucky winners. Go to Karma Wilson’s website (http://www.karmawilson.com/) and find out the name (but don’t tell me yet) of her newest character who makes her debut in Where is Home, Little (fill in the gap)?, the story abut a baby penguin who finds her way home to her family. This is the first book in a new collaboration series with illustrator Jane Chapman. Once you know the name of the penguin leave a message in the comments field below. If you are one of the lucky winners, I will contact you directly and you will need to tell me the name of the penguin before the mailman will deliver the book. Don’t forget to leave me your contact information with your comment — a valid e-mail address is a must (thechildrensbookreview AT gmail DOT com). Alternatively, you can provide your e-mail address by going to our contact us page after leaving your comment. Bloggers who have their e-mail address accessible on their blog profile need only sign-in before leaving a comment. The contest will run April 30th – May 5th, with the winners being drawn and announced May 6th. Winners will be picked at random using a random sequence generator and will have 72hrs to claim their prize. Unclaimed prizes will be awarded to an alternate winner. Disclaimer: Names, e-mail address and physical addresses of all winners will be used soley for the purpose of fulfillment of the giveaway. Example: I know the answer! Looking forward to another adorable book … I know the little penguin’s name! I know the Penguin’s name it is L—– P–! I know, I know 🙂 The new book looks so cute. I love the artwork. Jane Chapman is a beautiful illustrator. This book looks adorable! We love the Bear series. I know the penguin’s name. Thanks for the chance to enter! I teach kindergarten, this would be great! You’re right, it’s a great book for kindergarten aged kids. Ooh, ooh, I know the answer! =) Thanks for the giveaway! What fun! I now know the name. Hope I am a winner! Adorable little penguin with an adorable little name. Please include me. Thanks. Thanks for playing along to your full potential!! And drumroll please….the name is….. The whole Bear series is fabulous. This giveaway is over, but stay tuned for the next giveaway that is coming soon.